Located 8 to 11 miles north of Salem on the east side of Highway 221 you will find three hiking trails next to the Willamette River. Hiking Trail #1 (southern most)We found this trail to be very pleasant to hike. Like most Willamette Greenway Trails, this is a short hike, maybe one mile in length. 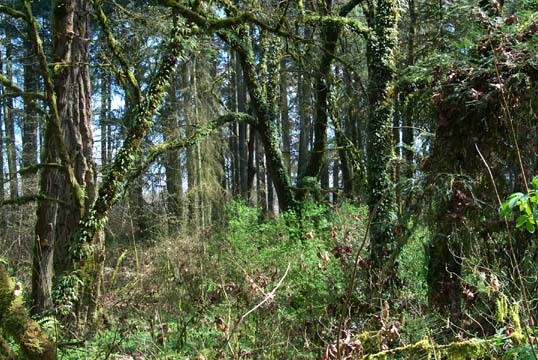 Traveling under fern covered trees, you follow a loop which travels from the trailhead, to the Willamette River and back. While hiking you will notice the many different type of windflowers commonly found in the Pacific Northwest. Hiking Trail #2 (middle)Unless you’re a dedicated fisherman looking for Willamette River access, you might wish to avoid this trail. It runs north from the trailhead near the Willamette River. Carved from bramble bushes with a machete this trail was hot, dusty and nothing of interest was found. Hiking Trail #3 (northern most, just south of Williamson State Park)This is the most interesting of the three trails, if you are only able to visit one, this would be a good choice. The trailhead is a short quarter mile drive from Highway 221. At the trailhead you will find a bathroom facility (no running water) and a large cut field. The large field is ideal for a picnic or a game of Frisbee. The looping trail is about 1/2 mile in length. Similar to trail #1, this trail offers the hiker a wide variety of flowers, trees and wildlife for all visitors.